Did you know that when you order from the Lush Kitchen, you can request samples? I'm not sure if it works for standard Lush orders or just the Kitchen, but if you pop a nice, polite little note asking for samples, they'll usually do it. Rather than list specific products, I like to ask for things like 'your favourite products' or 'the best summer products'. When I asked for the latter, a little pot of Salted Coconut Hand Scrub was snuggled up inside my package. After trying it, I loved it so much that I bought a full sized pot. 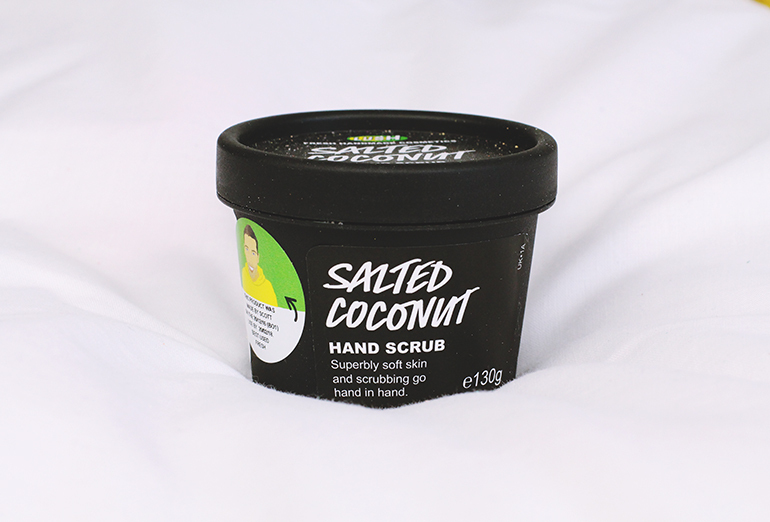 Salted Coconut is held in a black pot so you can scoop out as much product as you like. The sea salt is pretty chunky but it sticks together well in a consistency that's not too gooey. As it's rubbed over the hands, it separates well so it's easy to wash off without any residue. Applying to dry hands gives a more vigorous scrub but if you prefer a more gentle application, it can be used on wet hands too. Oh man, this stuff smells good! I'm not usually a fan of coconut but there's something about this that just smells incredible. I think it's the addition of argan and neroli oil, giving a more fresh fragrance than the usual Malibu sickliness I associate with coconut. The fragrance lingers on the hands long after it's rinsed off which means I keep sniffing my palms like a proper weirdo! Nothing has made my hands feel as soft as this. Obviously it exfoliates like a dream, but it also leaves my hands feeling super moisturised. It's strange because during the scrubby experience, it doesn't feel like there's any moisturising happening but then you rinse it off and it's pure nourishment. Ok, now I am going to Lush the minute they open tomorrow and buy this.